A rather stunning whisky shop in Leiden has been running its own festival for a couple of years. Every year, of course, accompanied by a festival bottling. I seem to remember a cracking Clynelish from a couple of years ago (split cask), and this year they’ve just released a bottling from my new favorite distillery (that’s a growing list, yes), Arran. They decided to have a sherry hogshead bottled (#2000/128) in February, just 14 days before it would turn 15. This most likely has to do with the deadline for the festival, and apart from a number it probably doesn’t change a thing. Anyway, a new bourbon cask is bound to arrive in The Netherlands and I’ve already been in touch with the importer to secure a pair of bottles from it. Fingers crossed for success on that front. This one then. A sherry hogshead so I expect a combination of sherry and American oak goodness. 55.7% is pretty steep, but nothing unmanageable. It’s quite mellow and waxy at first, with a hint of peaches on syrup behind it. Some hessian and pepper follows. Quite sharp with nice dried fruits, but those notes are rather faded. I find this surprisingly waxy, especially for an Arran. Some honey, beeswax. Quite sweet so no candles or anything like that. The palate is surprisingly soft at first, but there’s quite a lot of black pepper that starts biting after that. It’s still waxy but less so and there’s a touch of sherry and bitter caramel now too. Still quite sweet and fruity. Peaches, apricot and plums. The oak is quite light and the fruit gets bigger and bigger if you let it swim for a while. Mostly peaches and apricots after some 15 seconds. The finish is heavier on the oak. The oak, peaches and wax make for a syrupy after taste. There’s also sweet caramel and it goes quite far to ‘stroopwafels’. But with extra flavors. Dessert like and really drinkable. Much more gentle than the peppery heat that suddenly popped up on the palate suggests. I expected much more sherry, much much more. There’s just not that much of it, which I like. It’s a sherried whisky alright, but it’s not doling out raisins and dates and figs everywhere. It’s more the gentle hint of fruits with some peaches and apricots in the mix. Mostly behind that you’ll find American oak goodness like beeswax and honey. Surprisingly, no vanilla. The dessert like caramel on the finish is lovely too and even though there’s lots of different flavors going on it doesn’t feel all that chaotic. It’s more like progression from A to Z. In short, this is a lovely dram. And for ‘just’ € 60 it’s very affordable for a cask strength, limited release from a distillery themselves (that not being an Indie bottler). 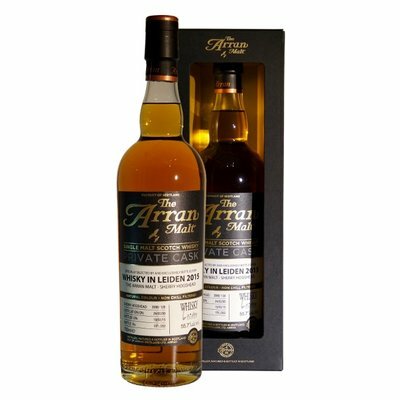 This entry was posted in Arran and tagged 2000, Arran, De Druiventuin, Islands, Isle of Arran, Private Cask, Sherry Hogshead, Whisky in Leiden, Whiskysite. Bookmark the permalink.